Monica Peterson is a storyteller, certified teacher, and actress. As a professional storyteller and actress, she has entertained at the JFK Presidential Library, and at festivals such as the Connecticut Department of Energy and Environmental Protection’s Great Park Pursuit at Rocky Neck State Park, the Connecticut Storytelling Festival at Connecticut College, New Haven’s Waterfront Festival, and Tellebration. She has made appearances at The Children’s Museum of the Arts in Manhattan, The Lockwood Mathews Mansion in Norwalk, Yale University, and UConn. Monica has performed at libraries, schools, and senior centers throughout the area including the Derby Neck Library, Torrington Library, and The Baldwin Senior Center. storytelling techniques helped her students develop oral language skills, sending several of her student storytellers to perform at the Connecticut Storytelling Festival with nationally recognized adult tellers. Monica’s work has been honored through the Stamford Public Schools’ Spotlight Award for Excellence in Teaching and the Board of Education’s Staff Achievement Award. Her stories of electrifying history, wise grandparents, and many cultures are perfect for libraries, schools, and senior centers. Learn more about Monica's services for adults, children, and youth workshops. Monica was our "main event" at our Annual Literacy Night. She captured the attention of all ages from Kindergarten to Grade Five AND even their parents. Her performance was an engaging connection to literature; full of fun props and acting that made the stories come to life. We would definitely invite her back again! I am writing to express our complete enjoyment during the Tales of New England presentation you did for our seniors. They are still commentating about it , describing it in detail, and wishing it were longer. An over all great performance. Patrons at the Torrington Library thoroughly enjoyed Monica’s presentation of “Tales of New England”. They were captivated by her storytelling, period costume, and overall execution of this splendid performance. They keep asking when she will return! It’s a great program for libraries at any time of year! Monica's dynamic approach to telling stories while incorporating history made this evening a very special event for young and old alike, and I highly recommend her. A terrific talent who kept a large audience fully engaged, stimulated, and asking for more. Monica perfectly combines information and entertainment. She presided over one of our best-attended programs ever. I was right there in 1664 with her and the heroes of that time! Afterwards, my son got in the car and retold the tales! We thoroughly enjoyed the evening. 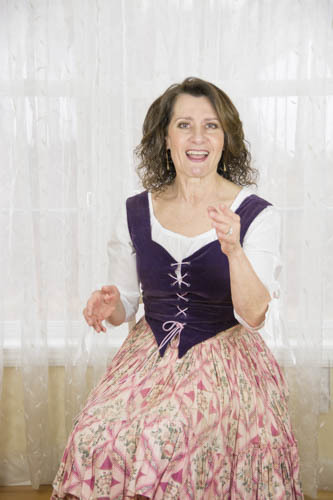 Monica captivates audiences with her contagious love of folklore and folly…she draws young and old listeners alike into the story, holding their attention and delighting their imagination. Once there was a raven-haired woman whose golden tongue could charm the birds from the skies… Children and grandparents who heard her speak jumped to their feet in joy. Her colleagues look to her as a resource of creative and exciting ways to engage students in the learning process. When parents were informed that their child had been placed her class for the school year, they were thrilled. Mrs. Peterson is a talented storyteller and has used this forum to engage students in learning about historical events as well as great literature. She has used costume to provide reference and authentic learning, as well as entertainment. Mrs. Peterson involved the students and inspired [them] to understand their roles and responsibilities in terms of taking action to make a difference. Monica has been telling/sharing stories with our kindergartners for years! Each year I notice the children enjoy them more and more! With common core and the high demands of teaching, there isn't much free time in our daily schedule. However, I always made time for Monica's storytelling as I knew that the children would benefit greatly from it. All of Monica's stories have a deeper meaning behind them and an underlying important message. Each story Monica would share would leave my students thinking deeper and asking questions that would always turn into a great conversation and inspiration for writing. Monica's enthusiasm is contagious especially among a room of 4 and 5 year olds! Monica always had a way of grabbing the attention of 150 children in one room at one time and keeping them entertained, which is not easy! Monica Peterson is amazing!!!! As a parent and part of the PTO at Toquam Magnet Elementary School, I have seen Monica work her magic. She has an amazing way to engage kids and adults in the story by making it come to life. You get so involved in the story that you don’t want it to end. Kids get inspired and want to read! I have seen her work with small groups and with big groups. She always amazes me! Mrs. Peterson is a fantastic storyteller! She manages to keep children engaged and wanting more. It is always a special treat when we get a performance from her. Monica Peterson is extremely creative and engaging. Her storytelling skills bring out the best in children's imagination. She is funny and entertaining and the kids love her. They help act out stories and she allows students to become motivated and creative with many follow up activities to her wonderful stories. She is a true gem and her enthusiasm is contagious. Storytelling is a motivating way to bring kids to love literature and stimulate vocabulary, imagination and creativity. She is priceless!